A very happy New year to all my readers. Technically we are in the first fortnight of New year, so guess am not too late (talk about covering up laziness with some lame excuses ). A long hiatus bordering into hibernation was what the blog experienced the whole of winter, and switched gears just in time for the first festival of the year. ‘Makar Sankranti’ call it Pongal, Lohri, Bihu or any one of the many regional names and forms in our diverse culture, it all sums up to the celebration of onset of harvest festival. Sun soaking, kite flying and lots of good food sums up the festivities of first celebration of the year- Makar Sankranti. 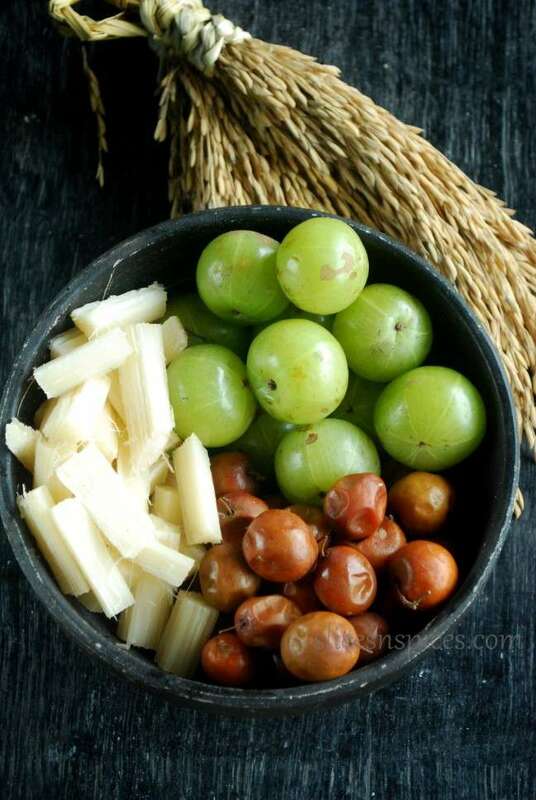 ‘ Til gud ghya god god bola‘ as in Marathi or ‘Ellu Bella tindu olle maatadu‘ as in kannada, highlights the significance of sesame (til )and jaggery (gud) used in various dishes made for this festival. 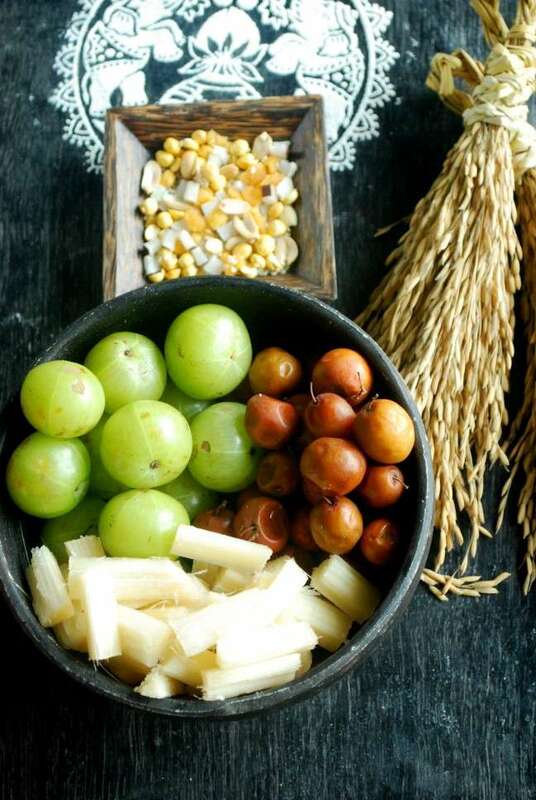 Be it in mixed vegetable curry, or chikki or holige or simply in distributing it with some sugar crystals , they are an integral part of sankranti celebration in many states . Ellu Holige/ Til Poli/ Sesame seeds- Jaggery sweet breads, is most commonly made during this festival. Nutty flavoured, sweetened with Jaggery and cooked with lots of ghee, this holige/ sweet bread remains one of my most cherished childhood memories of Makar Sankranti. The recipe of Til poli/ Ellu holige only differs from puran poli / holige in its stuffing, the dough remains the same. 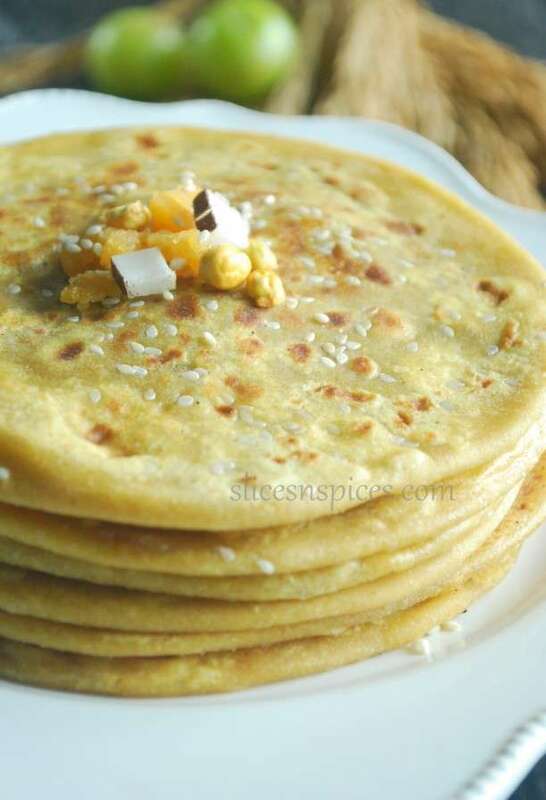 You can find the recipe of basic Puran Poli/ holige here. 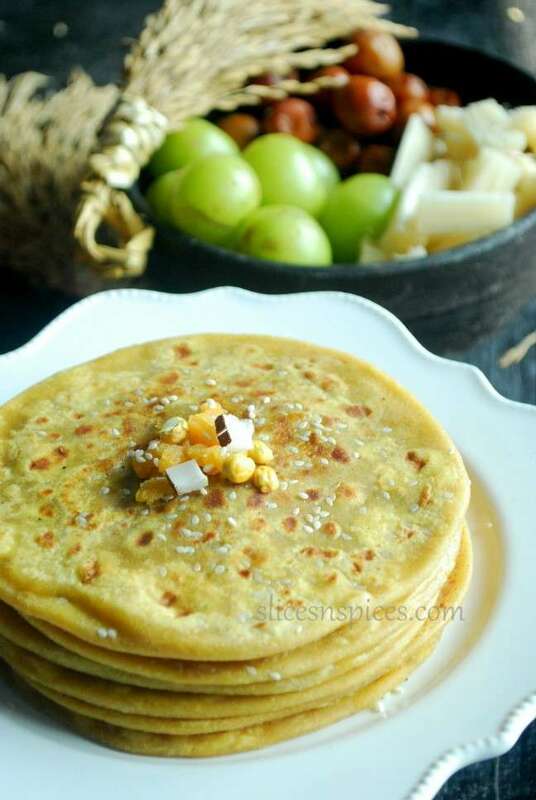 The recipe for Til poli/ Ellu Holige/ Sesame seeds jaggery sweet flatbreads is as follows. Make a soft dough with the whole wheat flour by mixing milk/water and other ingredients. 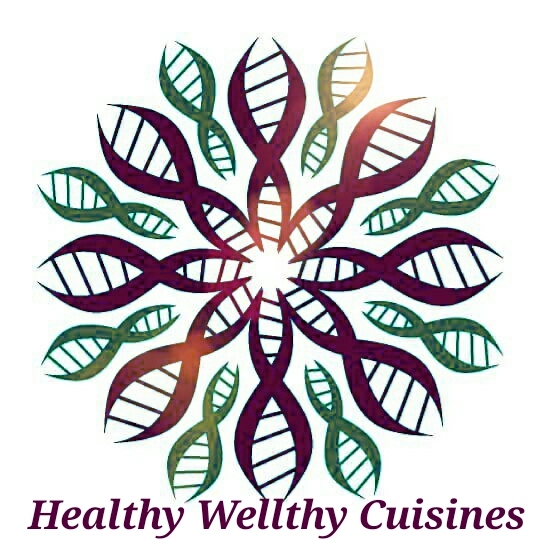 You can replace a part of whole wheat flour with all purpose flour ( maida). Knead well so that the dough is soft , allow it to rest for 30 minutes. Grind roasted sesame seeds, Jaggery and cardamom. Add ghee,milk ( if the mixture is too dry ) and mix well, make small balls. The filling should be soft and pliable and not too hard, as it will not spread out while rolling. Divide the dough into eight to ten equal parts, stuff the filling in each dough ball. Roll out evenly with rolling pin to make round parathas. Heat a skillet , cook the holige well on both the sides using ghee. Serve piping hot with more ghee. Make sure the dough is soft, well rested ( atleast for 15-20 minutes) before proceeding. When the dough is resting, drizzle some oil all over its surface to prevent its surface dryness. If the filling is slightly less or equal to (almost) the outer dough, it makes for thin covering and soft holige. Here’s wishing all my readers a very happy Makar Sankranti!! Happy Ugadi with Holige ( Puran Poli)!! My 50th post! !